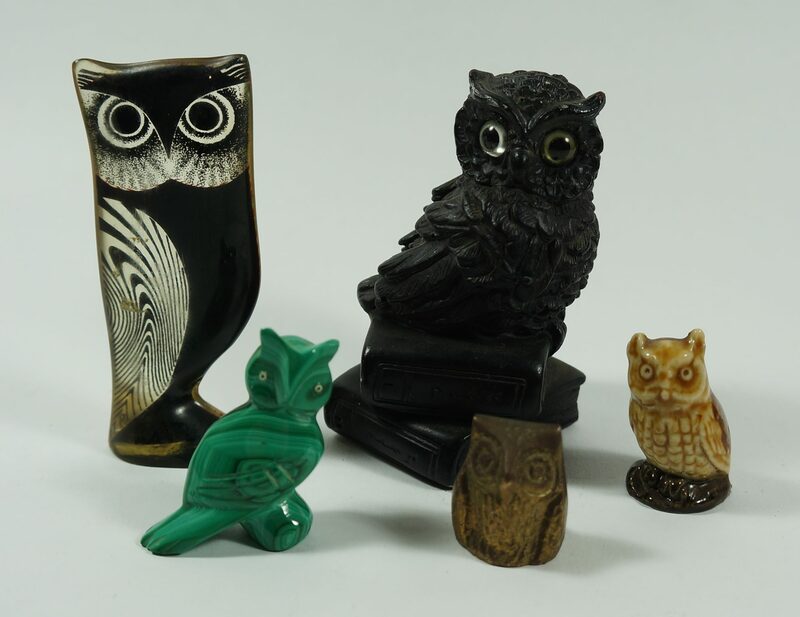 the green owl is made of malachite. might your lucite “cookie be a crescent moon? Your Palomar owl looks like a Ken Edwards owl. Does it have a KE on it? I think it does! They don’t seem to sell for a lot but it is a very cute piece. I’ve sold them for US$35-40 on Etsy. Hmmm, ok then lol. Will definitely investigate further. I think my personal favourite is in the Owls of Central America pic, the guy in the front row, second from the right, with the blue accents. Hoot hoot , what a find , I have one ceramic owl I found on the cleanup . You will make quite a bit on these if sold to a collector. Seconding malachite on the green stone owl! 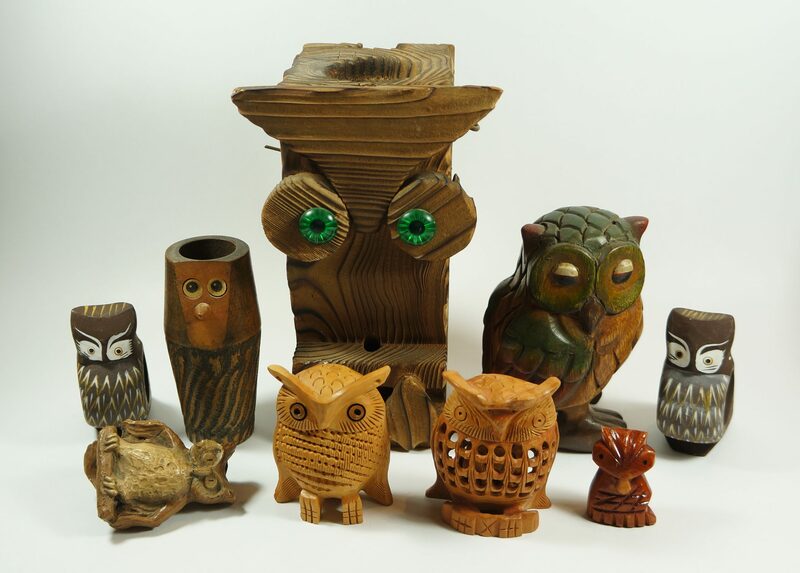 A real bonanza for owl collectors who read this blog—it’s the motherlode! … and this one looks almost exactly alike. It does, thanks for doing the research! How sad that soneone’s prized collection was unceremoniously dumped in a bin. Glad you managed to rescue it. 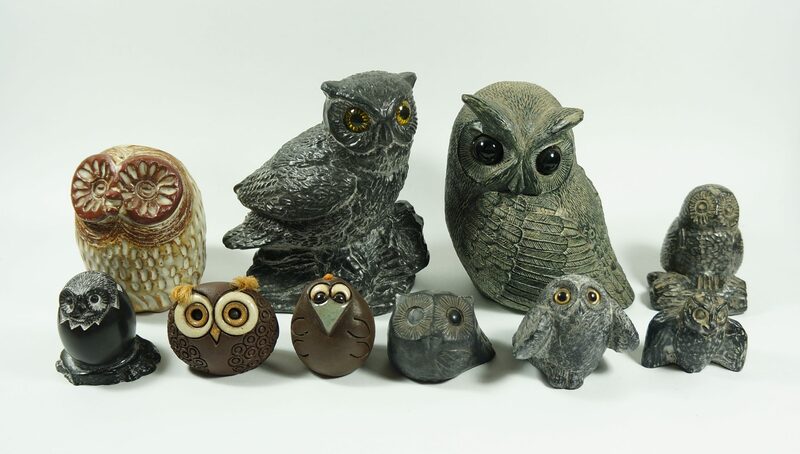 im mezmorized by ALL the owls I had to lok 3x and stll don’t have a favorite. great find! I like that one as well, though I don’t think I’ll keep it. How deep in the West Island are we talking? Marianne Suda was born in Vienna Austria in 1928 and immigrated to Canada in 1954. 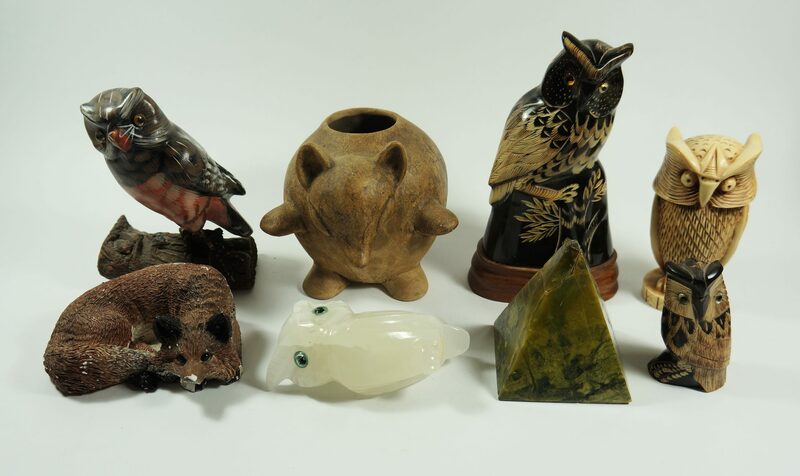 She created a series of animals in clay that were quite popular at the time,but only produced them for less than a decade. She was deeply inspired by 1960’s danish pottery so even her recent works are often mistaken for vintage pottery from Scandinavia. Thanks for the info! I knew I was reading the signature wrong… I have two of them, so it might be worth it for me to list them as a lot on eBay. Perhaps keep an eye on my eBay listings? Love owls. So hard to believe someone threw all those out. Amazing that someone would trash a collection like this! But, then, you never know, perhaps there was bad blood between someone and the owl owner! 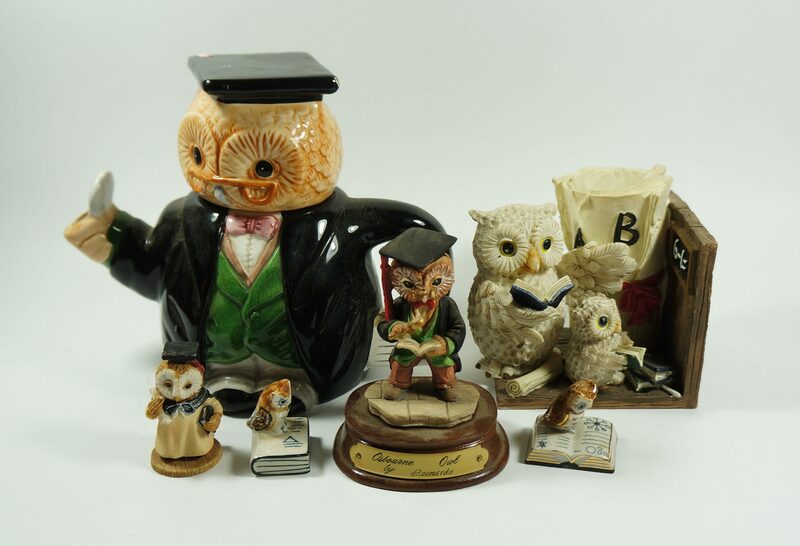 Anyway, congratulations on your “owl haul”. My favorites are the painted Mexican ones. I have a bird in that style from Mexico. I also know someone who likes owls so I will forward this post to him, just for fun. Thanks for the fun look at an awesome collection. Cool collection, and nicely curated here, Martin. It’s fascinatinv to me how humans are compelled to collect. 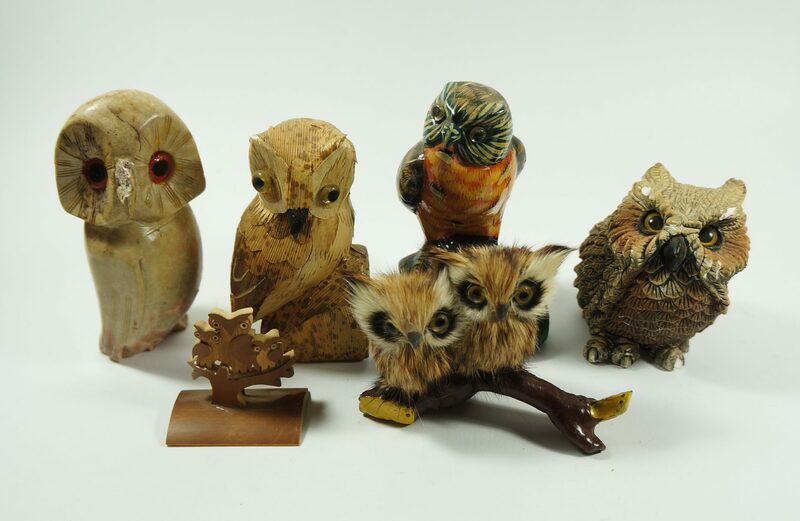 As a collector of too many fountain pens, I can really relate to the numerous little owls here. 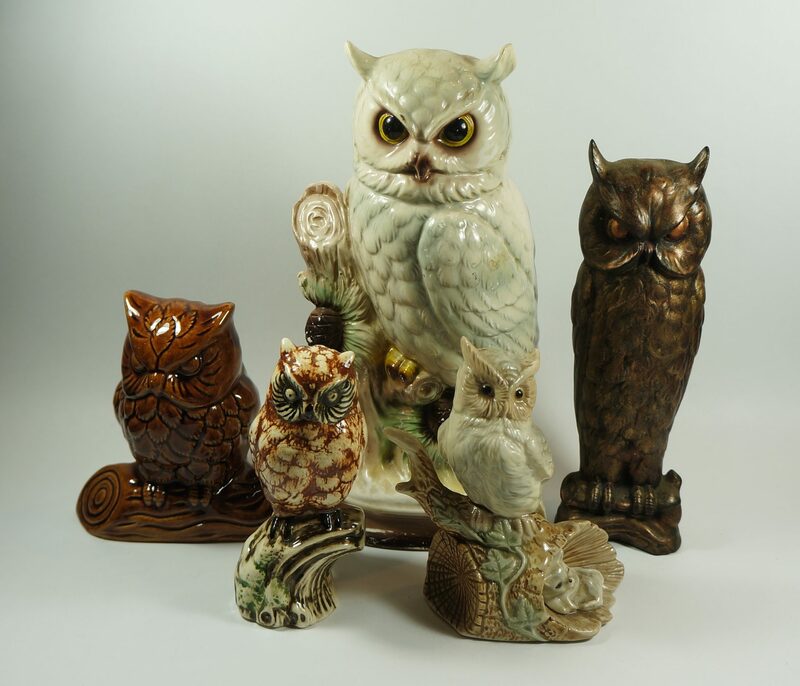 I’m hoping other owl collectors fund your sales listings and are thrilled to find certain cool owls they’ve been searching for. Oh, do make a post about keepers! Was this a particularly wealthy street?It is so stupid,wasteful and stunning that someome would throw out such a large collection of quality owl figurines. Not really, fairly middle class if that. You can find good stuff anywhere, it often just depends on how people decide to spend their money. Very well curated groupings. Kudos! I would be fascinated by your clean out process if you cared to blog about that. Basically I collect a lot of junk. Re: yard sales: I pick up a lot of good stuff that sells right away at yard sales, some niche stuff that may or may not sell quickly, and some stuff that is nearly garbage but kind of interesting to look at (ie: something that is unlikely to sell, but that makes a fun conversation piece). If something doesn’t sell after multiple yard sales I get sick of looking at it and put it in a “free box” for others to pick through. A lot of the free stuff ends up getting taken, but some doesn’t – that’s the way it goes. Fortunately I live in a dense neighbourhood and a lot of people end up passing by the boxes, so most usable stuff doesn’t go to waste. I also make sure to only do these purges when there’s no rain or snow in the forecast. Regardless, I think it’s good to purge regularly to make sure my yard sales stay “fresh” and to reduce the pressure on my limited storage space. Plus, one of my mantras is “There’s always more garbage”. Given that I trash pick as a full-time job, I can say with confidence that there’s no shortage of junk and keeping it under control is a must. At the end of the season I do an especially large purge because I know I’ll collect a bunch more stuff during the winter and won’t be able to unload it via the yard sale. My storage on Coloniale, for example is now about as clean as it’s even been. The most recent development is my discovery of this local auction house, which has really revolutionized my business. I only started going there in June, and I’m still restructuring (reorganizing isn’t a strong enough word) my old stock with them in mind! Lots of yard sale stuff has gone there, lots of forgotten basement stuff has gone there, and some eBayable things have gone as well. I was never going to have time to deal with all the quality junk I accumulated, and I’m happy I now have an outlet to get rid of it at little effort. At some point in the future this restructuring will be done, and I hope this business will run more smoothly than ever before. At that point, cleaning out will become less of an ordeal, though the yard sale purges will always be necessary. Thanks for the explanation. 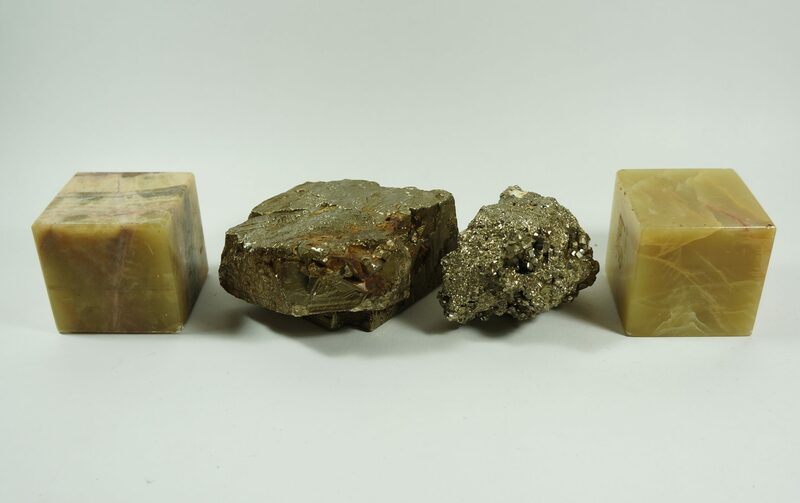 I’ve been excited to follow the auction developments and what “lots” they sell. Pity their site isn’t as easy eBay. Ah well. Good luck with the restructuring! 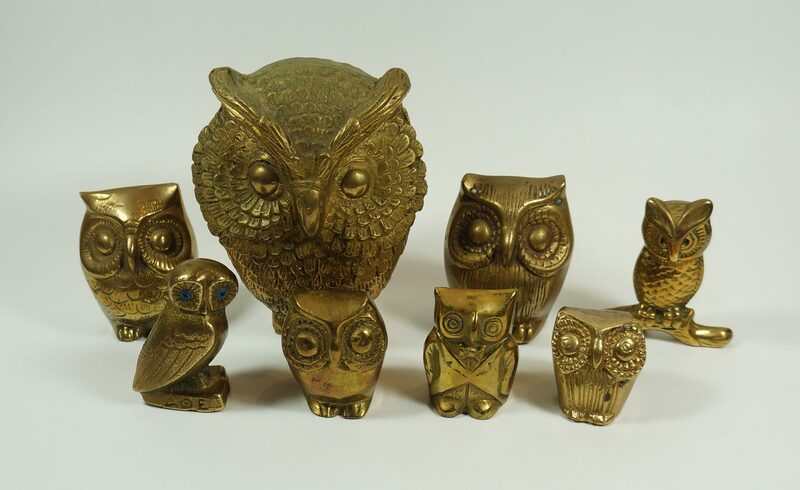 The shiny flat owl from Torino is for holding earrings! Its from the 70s I think. I just recently found one myself at a thrift store, of a mouse holding Swiss cheese. Of course my favorite one turned out to be worth the most $$! I guess I just have good taste. It is really beautiful. 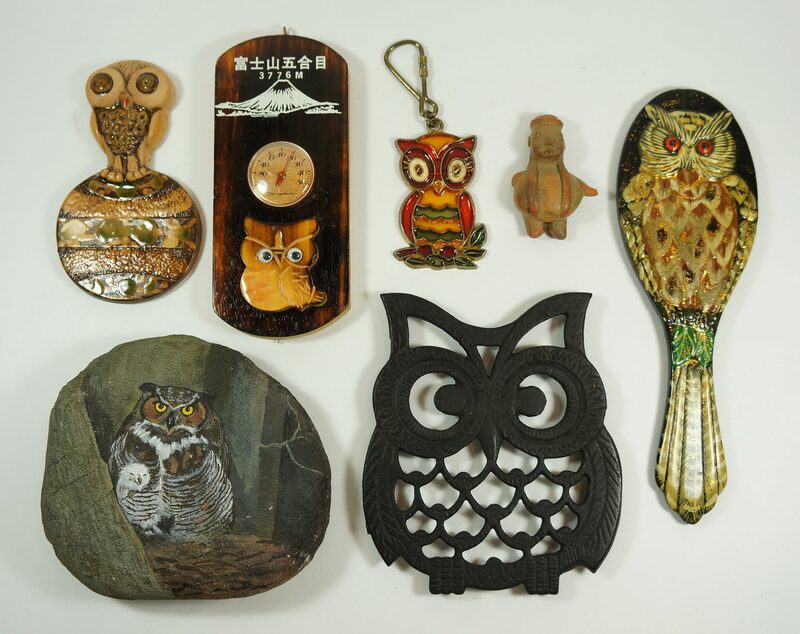 The big owl with the green plastic eyes is actually from Japan. The wood is cryptomeria. Also, the two owls on the scientific books (that your roomie likes) may be made by Klima. I figured it was from Quebec because there’s a lot of bulky wooden folk art around these parts, and this fits that style somewhat but I think you’re right about the wood being Japanese. Those do look like Kilma pieces. 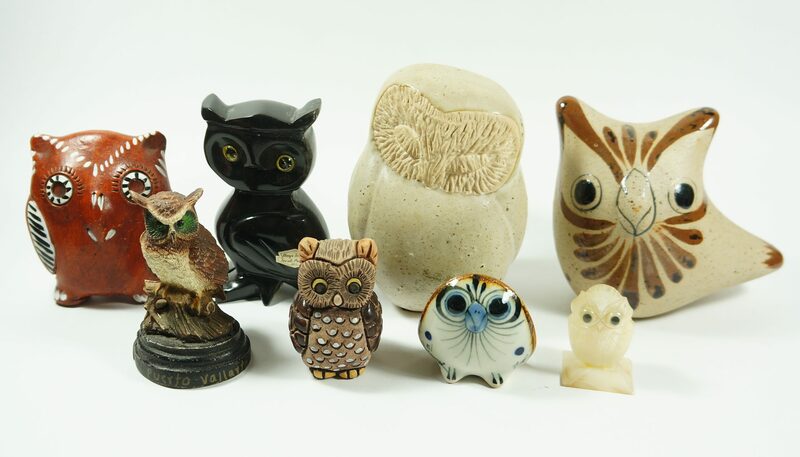 As someone who collects owl figurines, I was sad to see such a wonderfully diverse collection thrown in the trash. Thank you for rescuing them. I found a total of 13 pieces in the photos identical to ones that I either own or own ones in the same style. 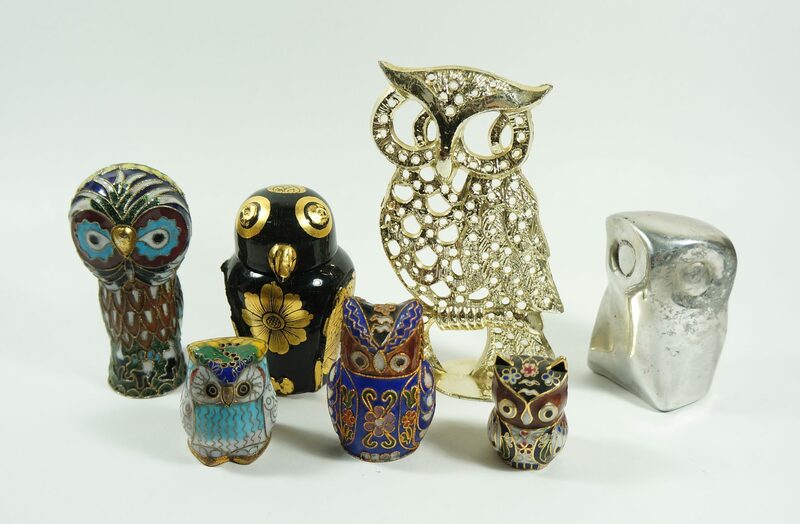 The black owl with the gold flowers looks like the russian nesting doll painting style. I wonder if the head comes off. Martin,my head tells me that some people who threw out valuable stuff might know about your blog and that they might be surprised or shocked when they see that their discarded items are being showcased on your blog. Does anyone in this category ever contact you?Keep up your Genius. I’d be surprised if that were the case! 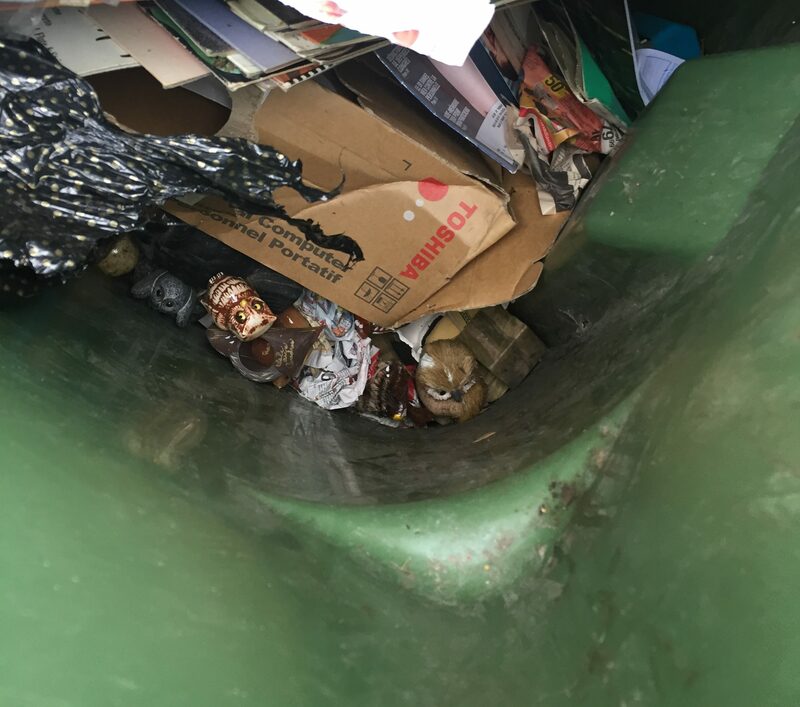 I would like to think that people who read my blog take better care of their items, at least donating them or leaving them in open boxes on the curb. I’ve never received an email like that anyways. In some Québec municipalities,like Beaconsfield now,people are charged for their garbage depending on the weight of their garbage.Other municipalities in some cases are adopting similar policies.Pointe Claire only has garbage pick-up once every two weeks.Many boroughs now have compost pick-ups.And McGill now has collection points set up at the end of the semester to encourage students who are planning to move to donate their unwanted but reusable stuff. Also ads about Eco-Depot keep playing on radio and Tv.Do you notice a slight reduction in waste output in the last two years?Do you pick up even a small trend? Honestly I haven’t seen a noticeable difference. I’m sure with the compost days some food waste is being diverted from the trash, which is a good thing, but there’s still a lot of garbage out there. 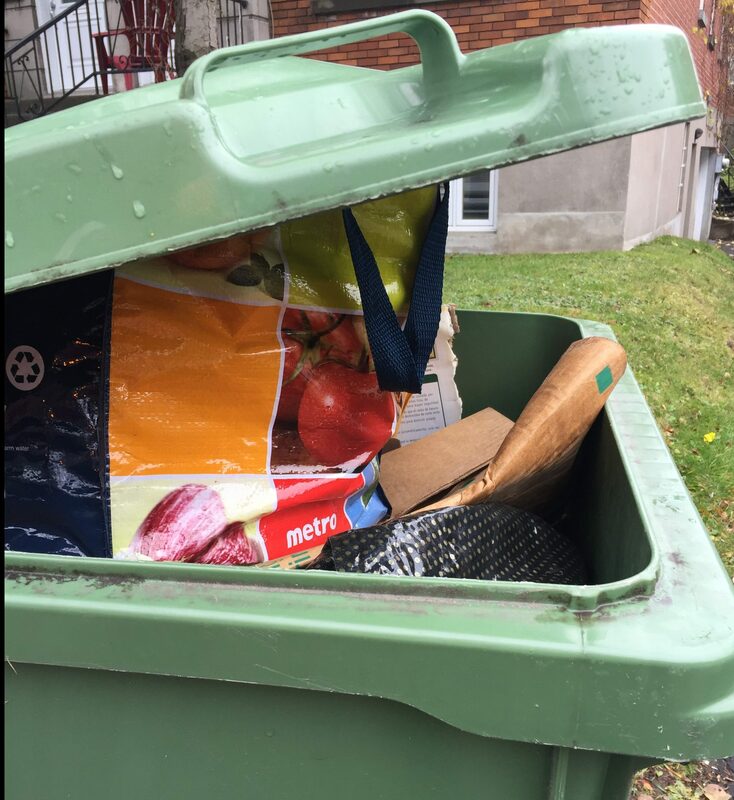 The composting thing is great for me though as many boroughs now have only one garbage day a week instead of two, which makes my runs much more efficient especially in places like NDG, CDN, the Plateau, Rosemont, Ahunstic, and Cartierville. Now the garbage is much more focused on that one day, and I can save a lot more in the course of one run. So, in a sense I am seeing a lot more waste / garbage even though in reality there’s roughly the same quantity as there was before. What a wonderful collection! As the owl is my spirit animal, I enjoyed these photos greatly. Thank you for sharing. 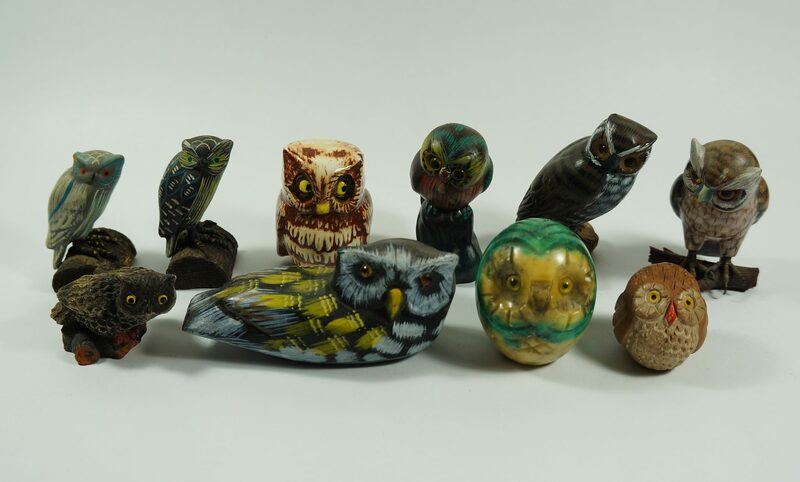 The green stone owl looks to be malachite (as others have posted), and if so, could be worth a pretty penny. I am a night owl.I come home late at night from parties and night clubs two or three times per week in some months..I do see people pawing through the trash in the Plateau and Rosemont at night,maybe for cans,bottles and scrap metals.But I see people also taking away discarded bathroom sinks,furniture and other assorted stuff occasionally. When the weather gets very snowy and cold,I guess you will be scavenging more often by foot in the Plateau,Mile End or Rosemont. There are a lot of can pickers in these areas. The furniture is largely taken by young students and people on tight budgets (unfortunately this is a big reason behind the spread of bedbugs). I do the vast majority of my runs by car now – it is just so much more efficient. I do walk sometimes but only around my own neighbourhood, which is the Plateau / Mile End, and I do that more to get out of the house than to find trash. 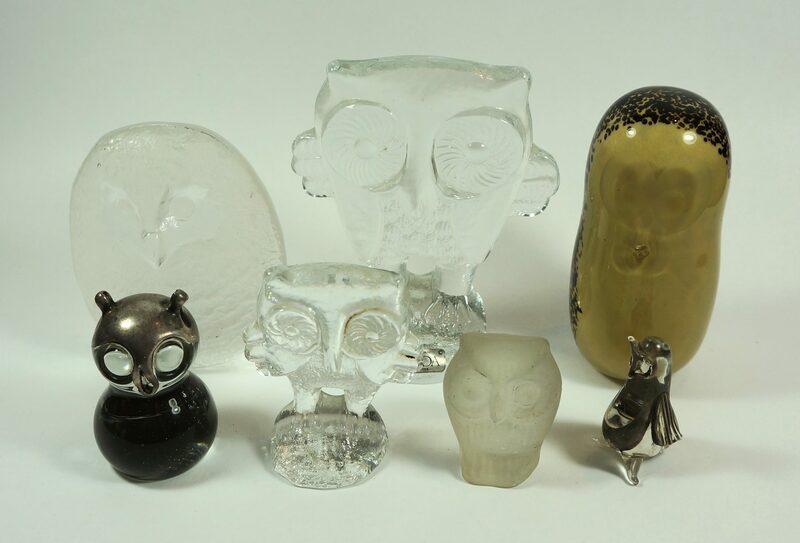 I care less for the glass owls because I find glass items break too easily,especially during moving.But I am fascinated with the educated owls,the wood owls,the metal owls and the ceramic owls that you found.You are one hard-working guy with a very sharp eye.I seriously want you to make a lot of money in November and December so that u can have a very joyous Xmas and new year. 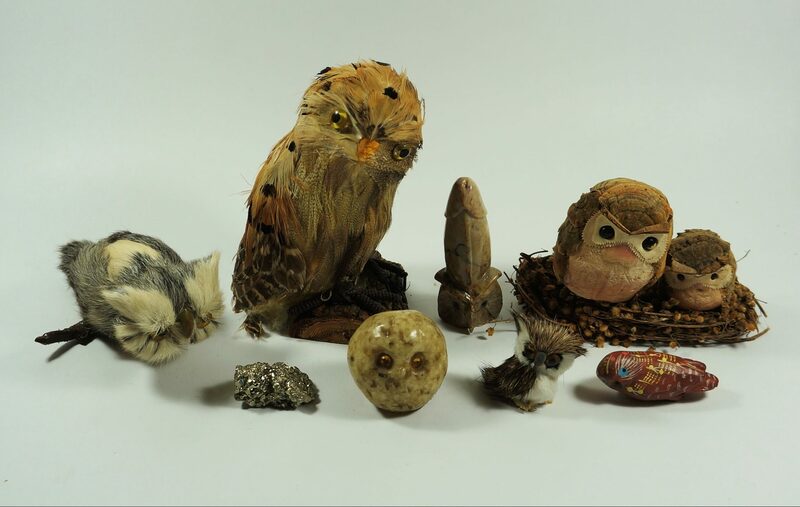 When I was a seller on Etsy owls were the most collected animal. I sold any that I found there. Nice collection! I plan on keeping the malachite on and my stepdad wants many of the others (including the brass). Sorry! 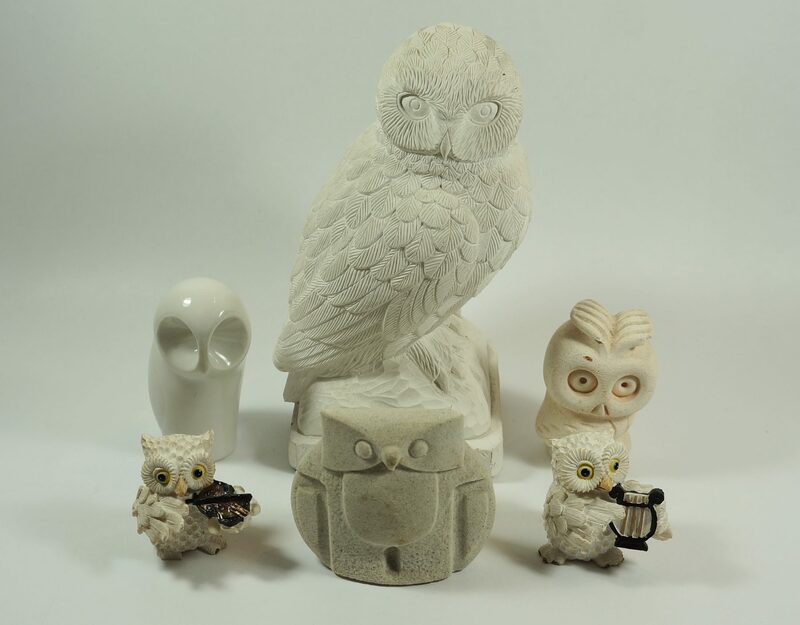 As an American dealing with horrible events lately, you saving owl figurines from the trash makes me smile. 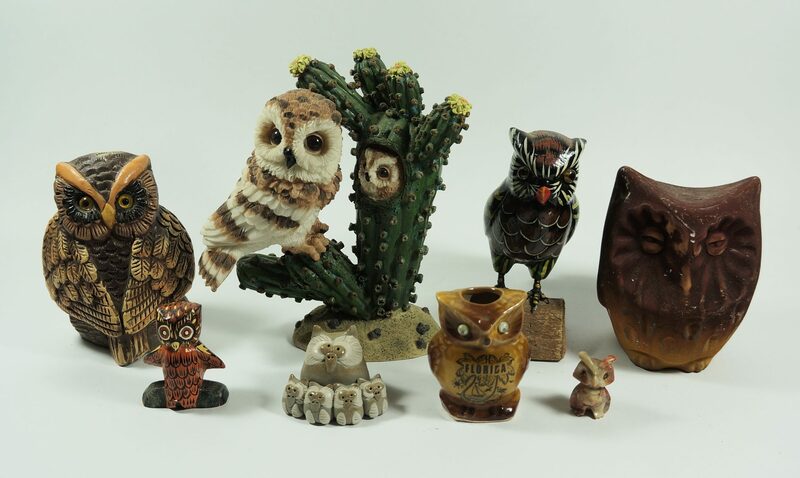 I’m not into owls, I collect bears myself, but I still think it’s cool you rescued all of these guys from the trash. And I have to admit I’m super jealous of all the cool stuff you find and post about here. The big white one that you said feels plastery may be alabaster. Greetings from Finland. 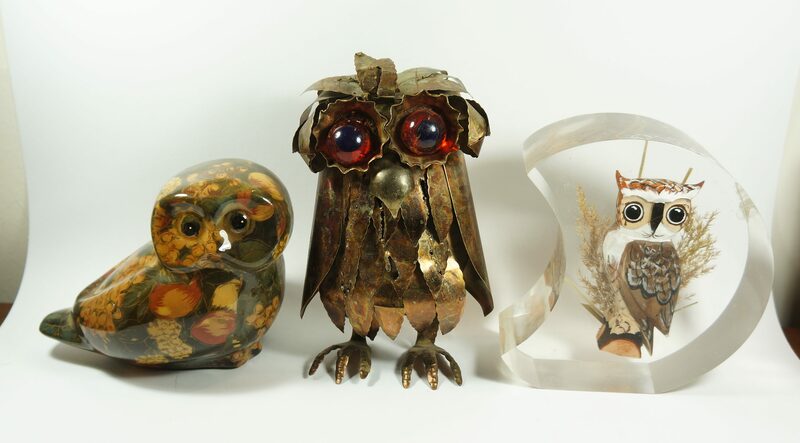 One of the owls looks like it might be one of designer Oiva Toikka’s birds/owls. Please google pics of his older work (so you don’t sell birds for less than they are worth). One of the solid metal ones looks like one I have. I adore the little fellow with the lyre!